Can You Freeze Thanksgiving Dressing? You can freeze Thanksgiving dressing using one of a number of options. Freezing enhances the flavor in some types of stuffing, while other kinds of stuffing may lose some quality in the freezer. Freezing dressing saves time and energy on Thanksgiving Day, time that you can spend with family and friends. Plus, you get to savor Thanksgiving stuffing long after the holiday. You can freeze uncooked dressing after you've assembled it; place it in a shallow container so it freezes quickly. 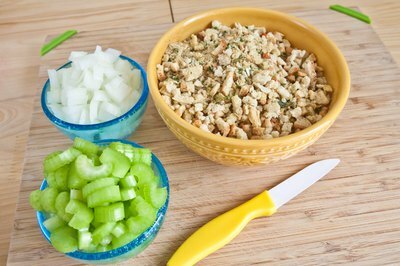 Or, freeze the dressing before putting it together, using separate containers for dried bread cubes, cooked onion and celery, and cooked, chopped turkey giblets or cooked shellfish. Celery and onions taste stronger once they're frozen, so adjust seasonings accordingly to stand up to their more intense flavors, or cut back on the amount of aromatic vegetables. Slightly under-cook stuffing that you plan to freeze by taking it out of the oven 10 minutes before it would normally be done to help it retain its quality. Cool it quickly to room temperature by placing the pan in another pan filled with cold water and ice cubes. Use a shallow pan for the stuffing if you have one, so it will freeze as quickly as possible, minimizing the growth of dangerous bacteria. 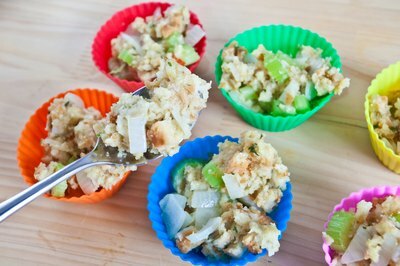 Stuffing baked in muffin tins freezes and re-heats quickly, which helps avoid problems with bacterial growth. 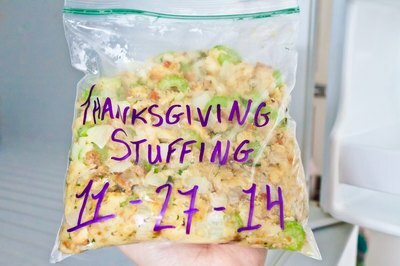 You can also transfer leftover stuffing from one large container into tins for freezing. Whether you're freezing fresh-baked dressing or leftovers, slip the muffins out of the tins once they're frozen, and store them in freezer bags. Reheat the number of muffins you want by microwaving them in 30-second intervals or baking in foil for 10 to 15 minutes at 350 degrees Fahrenheit. Frozen dressing, cooked or uncooked, keeps in the freezer for two to six months. Reheat cooked stuffing and cook uncooked stuffing, either in the oven or the microwave, until it reaches 165 F on an instant-read thermometer when you insert it into the middle of the dish. 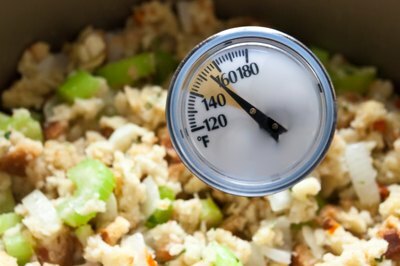 It's not safe to reheat stuffing in a slow cooker, because bacteria have a chance to grow during the time it takes for the stuffing to reach 165 F.